There was also pain regarding the lack of resolutions put forward prior to convention to stand with our brothers and sisters of color, especially in the wake of church burnings, and the shooting at the Emmanuel AME Church in Charleston, SC. The pain was also present as delegates recognized the loss of life that would continue in Palestine and Israel as the resolution regarding standing with Palestinian Christians was tabled for two years. That pain led to the drafting and approval of a resolution on Saturday to stand with MCUSA partners for peace in Israel and Palestine. With all of this pain, the question remains, where do we go from here? 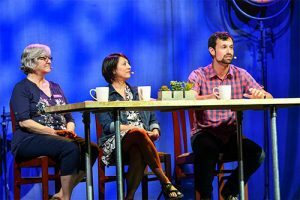 The theme of this year’s convention was “On the Way.” Throughout the week speakers in worship services and delegate sessions spoke on the Emmaus road story in Luke 24. The story begins with the finding of the empty tomb, where the crucified Christ was laid. This news is reported to the apostles before two leave for a trip to the town of Emmaus. 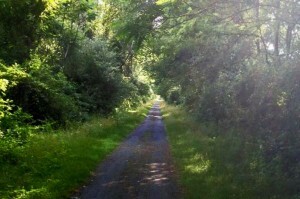 Along this journey they encounter Jesus, although they do not know it is him at first. As they talk of all that has happened they miss that Christ is in their midst. They recognize Jesus only when they begin to break bread. As the men return to Jerusalem and Jesus appears before the disciples they still doubt. Christ bears the wounds of the cross, revealing the pain he endured. The pain that led to this moment and now has made it possible for his ascension into heaven, which is where this chapter ends. This is not the end of the story, rather the beginning of a new chapter. Pain is not always a bad thing. Christ’s pain led to the salvation of God’s children. What happens with the pain endured? Christ’s pain led him to God’s side as he ascended into heaven. As Franconia Mennonite Conference moves forward and continues into this new chapter, may the conversations not be so all consuming that the sight of Christ among us is lost. May the pain felt by sisters and brothers be acknowledged as Christ acknowledged his and may this pain draw us closer to God as Christ’s did him. Riding in an airplane or a bus, the transportation to Kansas City was likely the easiest part of the journey for the 57 Franconia Conference delegates at this year’s Mennonite Church USA gathering in Kansas City that began on Tuesday, June 30th. While there are still two days remaining, delegates have already worked on discerning difficult topics from denominational membership guidelines to drone warfare. 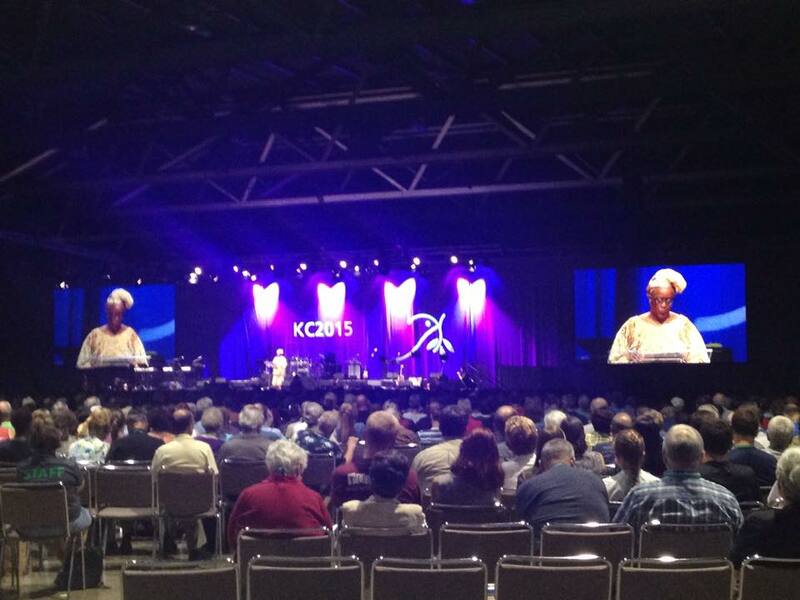 As the delegates gathered on Wednesday morning for the opening session, Elizabeth Soto Albrecht, moderator of Mennonite Church USA, reminded delegates that as racial tensions rise following violent events in Ferguson, Missouri; Charleston, South Carolina, and others, we need to come together to create peace. The first day of delegate sessions, Wednesday, the delegates considered resolutions on faithfulness amid endless war, and on Israel/Palestine. In addition, a third was brought forward asking for the delegates to acknowledge and extend forgiveness in response to the Executive Board’s statement of confession in an April pastoral letter to delegates. While the resolution on forgiveness was passed with extensive support, the others were not smooth processes. Faithfulness amid endless war was approved with an amendment, yet delegates expressed feeling rushed through the process. In the afternoon, the resolution on Israel/Palestine came before the delegates and several concerns were expressed. One delegate raised the point that many in his congregation are employed by Caterpillar, one of the companies listed as being deeply entrenched in the conflict and one that could be boycotted upon passing this resolution. He expressed concern for his congregation members’ jobs and the church’s ability to support them if they quit. Others expressed that as a peace church there is a call to build bridges — not “take sides.” Still others brought up the need for relationship building with the Jewish and/or Israelis, as well as Palestinians. Two initial polls were taken to determine levels of support for the resolution; after much division, a motion was brought forward to table the resolution until the next assembly in 2017. Delegates voted by ballot on whether to table the resolution, and the motion to table passed by 55 percent — 418 in favor, 336 opposed, 28 abstaining. The delegate session began with opening remarks, prayer, some singing, and a disruption by a few persons, intended to make a statement for the LGBTQ community. This disruption was quickly over taken by singing, although there were a few boos amidst the otherwise shocked delegate body. Elizabeth Soto Albrecht then read part of a statement from Pink Menno stating they were “de-pink[ing] the delegate session as a sign of their opposition to the resolutions at hand. Pink Menno supporters wore trash bags over their pink t-shirts. Soto Albrecht stated it is important that their voices be acknowledged. A time of singing and prayer re-centered delegates. 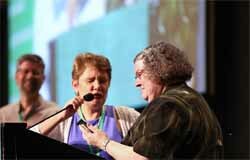 The authors of the forbearance resolution — Charlotte Lehman, pastor of Reba Place Church in Evanston, Illinois, and Megan Ramer, pastor of Chicago Community Mennonite Church — then framed the forbearance resolution prior to the delegates’ time of discernment. Lehman said, “We know we have differences of conviction, but we don’t want a political debate. We long to have the kind of healthy conflict that you can only have with people you love.” The authors acknowledged they have differences between their two congregations. Lehman went on to say, “conflict is not the enemy. The enemy is the enemy. We want to glorify God in both the outcome of our dialogue and the way we conduct our dialogue.” The resolution went on to be approved by a 71% vote in favor: 581 yes and 228 no. The day continued with discussion and discernment on Mennonite Church USA Membership Guidelines. This proved to be a resolution in need of clarification. Ervin Stutzman, executive director of MCUSA, referred to the Frequently Asked Question document, prepared for and released to delegates on June 18th. 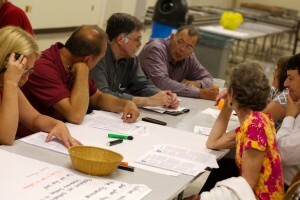 After prompted by question, he noted, “If both of these resolutions pass, the Executive Board will see it as a mandate to hold together the traditional stance of our church with an approach that grants freedom to congregations and area conferences to work things out in their own context, with mutual accountability with the CLC … If the resolution on Membership Guidelines does not pass, the Executive Board will take it as a mandate to free congregations and area conferences to work out their own practices without specific accountability to the commitments stated in Part III of the Guidelines. In any case, the Executive Board will take into account the degree of support or non-support for each resolution in the voting process, as well as the specific feedback from table groups.” Following much discussion, the delegates voted to approve the resolution with 58% affirmation: 473 yes, 310 no and 28 abstentions. However, the day was not over for Franconia Conference delegates or those attending convention on behalf of Eastern District. Conference and congregation delegates from both conferences joined for a time of reflection on the week and dialogue regarding what this means for us moving forward. With over 60 in attendance for the conversation, Charlie Ness of Perkiomenville congregation, Lorie Hershey, pastor West Philadelphia Mennonite Fellowship, and Warren Tyson, conference minister for Eastern District Conference, shared their reflections on the week and hopes for moving forward. Warren Tyson said the imagery he once heard of the Spirit being like a “wild goose” came to mind. He said “the goose comes in and flaps around, makes lots of waves and noise and commotion, and disrupts life.” He wondered if there was a sense that God was wanting to stir us up and maybe even have us feel pain. Yet, there was profound hope in the room amongst Eastern District and Franconia conferences’ delegates. All three of those who shared spoke of the deep and authentic conversations that happened at the delegate tables. They spoke of the differing views and how, through that, they were able to see one another as people. By doing so, some were even shifting in their understanding and perspective. May God grant us wisdom as we continue on this journey together. May we strive to allow the fruits of the Spirit to guide us. May we see one another as God sees us. On Saturday, July 4th the delegates met for a final session where they passed two more resolutions. 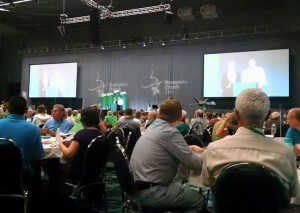 The resolutions included a statement proposed by the Mennonite Palestine-Israel Network (MennoPIN). The statement declared support for both Palestinian and Israeli partners in peacemaking and was written after the tabling of the Israel/ Palestine resolution. The other resolution discerned on Saturday, a resolution of expression and lament, called on MC USA and “all its parts [to] continue to build awareness and direct resources and energy to continued anti-racism education among our constituencies and to stand in solidarity with the African-American community as destroyed properties are rebuilt and ministry occurs to broken bodies and souls.” Both passed with overwhelming support. 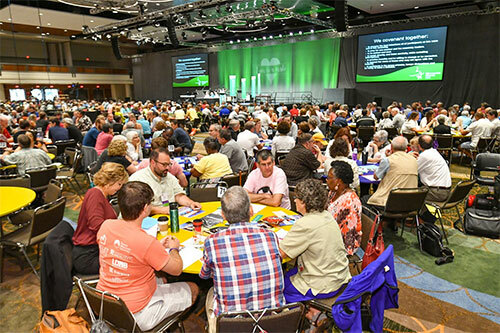 Following the final resolution discernment, the delegates received a report from Mennonite Central Committee, the Listening Committee, and the Anti-Racism Team. Many affirmations and concerns were heard by the Listening Committee and they noted that many of the concerns were around procedure. The Anti-Racism Team noted that this convention was the most diverse convention to date. However, the delegate sessions did not reflect this diversity with only 10% of the delegates being people of color. To end the day, Ervin Stutzman, executive director of MCUSA thanked Elizabeth Soto Albrecht for her service as moderator over the past two years. Patricia Shelly and David Boshart were then installed as moderator and moderator-elect for the next two years. “I’m glad that you took time out on our first heatwave of the summer to talk about some potentially hot topics,” Steve Kriss, LEADership Minister at Franconia Conference said to Conference delegates on Thursday, June 11th. The delegates had gathered at Christopher Dock High School to review delegate responsibilities and discuss MCUSA Convention 2015 resolutions. Some were delegates for Convention, while others were delegates for Conference Assembly. With only two weeks left until Convention, the delegates sat at five tables discussing upcoming resolutions to be voted on at Convention. The 36 attendees also reviewed the roll and call of a delegate. A total of 230 delegates will represent the Conference between Convention and Conference Assembly. “We have gathered here this evening to discuss important matters in the Mennonite Church,” Conference LEADership Minister Noel Santiago said. After opening remarks from Conference Moderator, John Goshow, Santiago led the delegates through a reflection on the role of delegates leading into a time of Scripture-based devotion. Questions were then posed to the delegates in a time of table discussion facilitated by John Stoltzfus, Conference Youth Minister. “Together, [with] our collective wisdom we can come together and new insights and revelations can emerge as we lean into each other,” Stoltzfus said. Moving between tables they discussed five questions World Café style, a discussion engagement style that seeks to obtain different perspectives between persons. Particularly, the delegates discussed the Status of the Membership Guidelines and Forbearance in the Midst of Difference resolutions. Multiple concerns were expressed on the Membership Guidelines Resolution. In general, the resolution was considered by some as complex, unclear, and unneeded, while others found it values mutual accountability, the Confession of Faith, and common commitment to mission. However, some expressed concern that four years is too long for the delegate assembly to set aside considering changes to the Membership Guidelines. Opinions on the Forbearance Resolution ranged between beliefs that it is a call for patience with each other and that it is “kicking the can down the road.” Some delegates found it wise and a seemingly biblical image of unity. However, some expressed that the ambiguity leaves them wondering how far it goes. Concerns regarding the Forbearance Resolution included that it may open the way for people to do “what they want”, though some believe the resolution reflects the value to search for wisdom with love and unity, having Christ as the center. Overall, the discussion allowed delegates to further understand the resolutions and hear one another’s perspectives. A lot of questions still remain from delegates, but the Conference is working on clarifying as much as they can before Convention. The Conference has begun planning for Conference Assembly preparing for how to address what may or may not happen in Kansas City. Communication will be shared with constituents as it becomes available. Kendra Rittenhouse, Salford Mennonite Church, believed the discussion will bring Franconia Conference unity despite differing views. Moreover, as a first time delegate, she has a positive outlook on Kansas City Convention and the anticipated delegate interactions. “I am expecting God to work. I am hoping that we can still hold onto one another even though we don’t agree, and that somehow we can roll through this new era [and] still have Christ as our focus,” Rittenhouse said. A video of the event can be found here. Also, a transcript of the discussion question responses can be found here. No doubt the outcome of this summer’s resolutions will spark further discussion amongst Conference delegates. 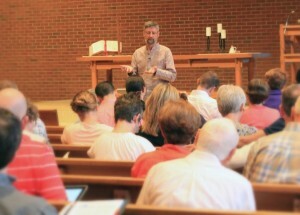 Ervin Stutzman, executive director of Mennonite Church USA, met with Franconia and Eastern District Conference members on May 28 at Zion Mennonite Church. The meeting aimed to educate attendees on the MC USA structure and what is happening in the denomination, along with preparing delegates for the upcoming Convention. “We are gathered this evening to know what it means to be delegates at Kansas City this summer,” Stutzman said. About one-fifth of the 68 attendees to the meeting were first time delegates. Stutzman reminded delegates their role includes prayer, open discussion, and discernment regarding resolutions. A delegate job description can be found on the MC USA website. One of the responsibilities of the delegates at the 2015 Convention, Stutzman pointed out, will be discerning what a “majority” is when approving resolutions. Previously, this has been 51 percent of delegates. MC USA is suggesting using a two-thirds majority approach. Delegates will be given time to discern what approach they would like to use prior to voting on the resolutions at Convention. Throughout the evening, Stutzman highlighted parts of Mennonite Church USA: An Overview, the Purposeful Plan, the updated 2013 Membership Guidelines, and the five Resolutions. The Purposeful Plan contains the “seven priorities” of the MC USA Executive Board. Page 20 starts a list of the priorities and displays specific goals intended to fulfill them. Stutzman reviewed the five Resolutions last. The first three resolutions were addressed individually: Israel-Palestine Resolution, Faithful Witness Amid Endless War Resolution, and the Churchwide Statement on Sexual Abuse. The other two resolutions relate to one another and therefore were talked about together. Those resolutions being the Resolution on the Status of the Membership Guidelines, and Resolution on Forbearance in the Midst of Difference. The Membership Guidelines were reviewed before assessing the resolution regarding them. Number 3, 4, and 5 of Part I of the Guidelines were highlighted to show the relationships of authority between congregations, conferences, and MC USA. Stutzman made note that this is important to remember when considering the resolutions on the guidelines and the resolution regarding forbearance. Stutzman also noted that Part III of the Membership Guidelines was added in 2001 and reviewed why and how it was added. He spoke of this section of the Guidelines being reviewed with the resolution as there is continued tension around the content of Part III.